Leeds driver Ollie Wilkinson continued his impressive debut Protyre Motorsport Ginetta GT5 Challenge season with his first two podium finishes at Rockingham over the weekend. Starting in pole position for round four of the championship, Wilkinson made a slow start and suffered a spin before mounting an excellent recovery drive to finish in ninth place. Quick off the line for round five on Sunday morning, Wilkinson climbed from ninth to third in just three laps and held on to earn the first silverware of his short career. Despite losing a couple of places at the start of round six, Wilkinson worked his way through the field to secure his second podium of the weekend in third spot. Rounding out an intense schedule yesterday evening was the cancelled third round brought forward from Oulton Park two weeks before. After a spin on lap four Wilkinson bravely worked his way up to 10th place at the chequered flag. 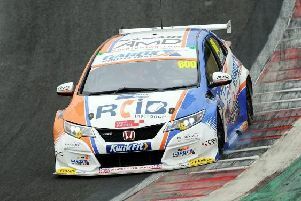 “I’m over the moon with my debut performance in what has been a very busy weekend at Rockingham,” said Wilkinson. “It’s amazing to get two third-place podiums, something I didn’t expect to achieve in my first season of racing in such a highly-competitive championship.